I admit it, I love eclectic albums where every song sounds different from the last one. And that's certainly the best way to initially describe the latest effort from Mark Bandola, aka Typewriter. Birdsnest opens with Silhouette Branch, a gentle ambient soundscape with swirling atmospherics and piano notes falling like a gentle rain. Ok, I think on my first listening, we're in for a mellow trip here. But all of a sudden, with a rushing crash, Holy Crow kicks in and were taking off with some trippy space rock. Ah well, I think, lots of bands do that, start off with an ambient prelude before getting to the rocking. But then Grey Green X-Ray follows, a brief, experimental bit of twisted noise. Hypnotised For Years is some easygoing (and very catchy) acoustic psychedelic pop with horns and flute! The Green Gates Open is all brooding drones and electronic dalliances that lead to some driving, Krautrock-style rhythmic workouts. I think you're getting the idea here. But what you may not be getting is that somehow this all works together to make for a great listen as a whole. There are some great songs on here, like the lovely, gently bouncy No Explaining with its retro-style tremolo guitar solo and the beautifully sad ballad Remember Daniela. But it's not all pop tunes. When you least expect it, along comes a phasing, freaky rocker like Gangway, with loopy bass and processed vocals or the majestic instrumental space rocker Where's the Gain For the Woman. We get lots of instrumental tracks too, like the retro-futuristic new-age meets Stereolab instrumental Orange Estate; the buzzing, experimental ambient explorations of I Live in a Tree; and the jazzy, nostalgic but dark noodling of Zero Hour. The nearly epic The Lost Elation actually starts with 5 minutes of lush and spacey synth meditations before slowly morphing into a churning, bubbling electronic cosmic rock song. It's all eminently listenable. Even the experimental bits are more like injections of strangeness that just add to the weird beauty and yes, the eclecticism of the album. 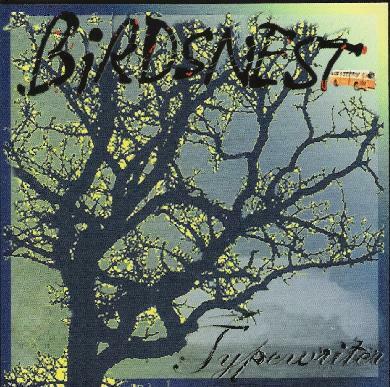 Birdsnest is a terrific joy to just kick back, close your eyes to, and get lost in its myriad sounds, noises and great tunes. You'll find sound clips and purchase information at: http://cdbaby.com/cd/typewriter2.